There were 1,100 fewer shops in Wales in 2018 than in 2010 - a drop of nearly 9% - according to the Welsh Retail Consortium. On Monday, firms saw the greatest rise in business rates in Britain, the lobby group added, saying they were partly to blame for the closures. It called for a freeze in the tax to help revive the high street. The Welsh Government said more than 75% of ratepayers received support and more than half paid no rates at all. Sara Jones, head of the WRC, said: "With declining footfall to our Welsh shopping destinations continuing to cause a major headache for retailers, and with shop vacancy levels amongst the highest in the UK, we need urgent action." Along with pressures such as competition from online retailers, business rates are a common complaint for high street shops. 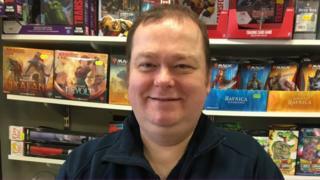 Paul Thomas, owner of A Better World Comics and Games in Merthyr Tydfil, said he was effectively priced out of the town centre. "The business rates become astronomical - it's just impossible for us to move to that area. "It's not just for us - if there were more shops in the town centre, if the high street were stronger, then we'd be stronger too." His shop qualified for small business relief and his rates have increased slightly to £150 a month, and he struggles "just to cover the bills". Ms Jones said rates should be frozen this year and lowered for all ratepayers in future. In contrast, the Scottish Government acknowledged the pressure on retailers with a below-inflation increase in business rates, she added. "It's time our own decision makers here in Wales recognise that further shop closures will be inevitable in 2019 without urgent reform of this outdated business tax," she said. Business rates were devolved in 2015 and a Welsh Government spokeswoman added they had already made a number of short-term changes to develop a Welsh-specific system. This includes "consulting on improvements to the administration of rates and bringing forward the next non-domestic rates revaluation". She said an extra £23.6m of support would be available from April through the high street rates relief scheme to help about 15,000 small and medium-sized retailers pay their rates in 2019-20. "This is in addition to the £210m provided every year to support businesses and other ratepayers with their non-domestic rates bills," she added.